The Learning Technology Center (LTC) is offering an all day Saturday drop-in on April 28th, featuring two Canvas Hands-On Instructional Workshops! This event is a great opportunity for instructors and staff who are not able to attend workshops or reach out to the LTC during our standard operating hours, to stop by and have their questions answered. Join us in our newly updated Active Learning Classroom, in McGraw 19A, for in person help and Canvas Hands-On training. Please be sure to bring your laptop or personal device. To sign-up for one of the Canvas Hands-On training times listed below, please click here. Contact us to set up a one-on-one appointment either in person, or virtually from 8:00am to 10:00am or 3:00pm to 4:00pm. If you are not able to make it to campus, no problem! You can schedule a one-on-one WebEx or Spark meeting during the one-on-one appointment times listed below by contacting the LTC. Please stop by to get your questions answered, stay until your problems are solved, and stop by to get to know Canvas! For further questions about the Saturday LTC Drop-In please contact the LTC at ltc@uww.edu. The Learning Technology Center (LTC) is seeking proposals from instructors who would like to participate in our inaugural Active Learning Academy. The Active Learning Academy will explore how to utilize pedagogy, technology, and space to increase student engagement and learning. Instructors completing the Active Learning Academy, in its entirety, will be eligible for a $1,000 stipend. What is the Active Learning Academy? Active Learning Strategies Seminar: Utilizing Pedagogy, Technology, and Space (Summer 2018): During the Summer of 2018, the LTC will offer a blended active learning instructional development seminar that features four modules that focus on the active learning ecosystem. Please take note that most of the work will be done online, but required face-to-face meetings will be held on Monday, June 4 from 10:00am-noon and Friday, August 3 from 10:00am-noon. You may find more information about the module topics, dates/times, and objectives here. Teaching One Course in our Active Learning Classroom (Fall 2018): Upon completion of the Active Learning Strategies Seminar during Summer 2018, instructors will teach their one Fall 2018 proposed course in the LTC’s active learning classroom. Picture of the classroom can be found below. Reflecting on Teaching (Fall 2018): During the Fall 2018 semester, Active Learning Academy participants will work with LTC staff to reflect on their teaching. This will include two class observations, one focus group with other Active Learning Academy participants, and facilitating student surveys. 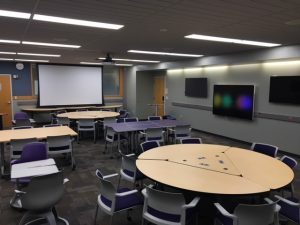 Sharing Best Practices (Winterim-Spring 2019): During Winterim or Spring 2019, Active Learning Academy participants will come into the LTC’s video recording studio to share insights from their experience. These insights will be shared with other instructors in the future who would like to incorporate active learning strategies into their teaching. Submissions are due April 13th. To prepare for your interest statement, please see the proposal questions here. 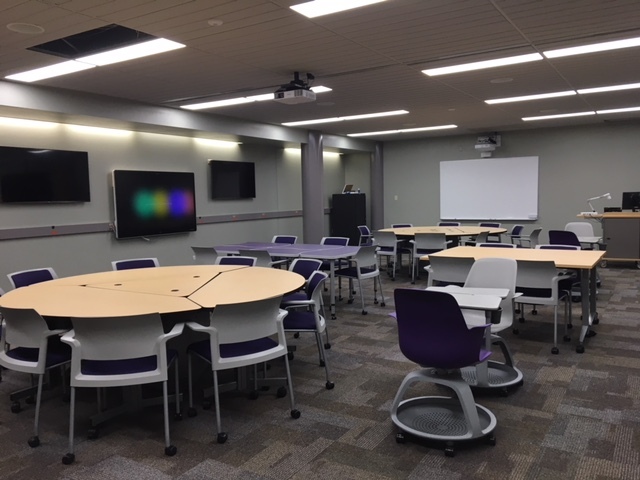 The LTC’s classroom has been designed to support interactive and technology-enhanced learning. To accomplish technology-enhanced learning, the classroom has a projector, an Interactive Whiteboard, four wall mounted displays, a Spark board, Crestron control system, and frosted windows that you can write on. The classroom structure promotes active learning methods by having all mobile furniture; including two large circle tables that come apart to form smaller groups, five individual tables that can be pieced together to form a rectangle, and four pod chairs with a writing surface and basket under the chair for storage. If you have any questions about the Active Learning Academy, please feel free to contact the UW-W Learning Technology Center. What is Cisco Jabber? Why should I use it? 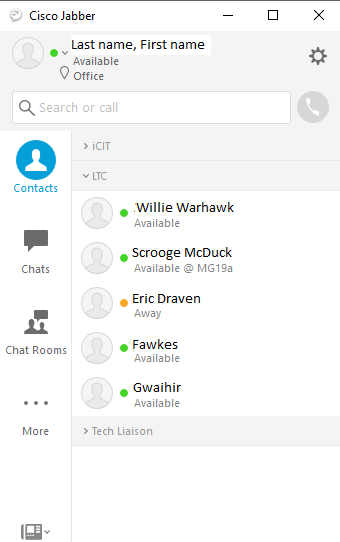 Cisco Jabber (or Jabber) is an instant messenger service used by and available for UW-Whitewater employees. Jabber is synced with your work phone, which means you can make and receive calls, view your call history, and manage your voicemails all from your computer, or mobile device (by downloading the app). Jabber also has the ability to be synced with your campus Outlook Calendar. If you are in a meeting, the instant messenger will automatically set your status as “Away” so others will know not to disturb you or expect an immediate reply to a message. 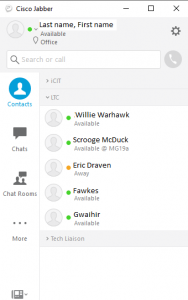 Jabber is already downloaded on all campus-owned computers. Which means, every employee on campus has the ability to instantly connect to each other. Have a quick question about something? You can send a message without worrying about your important message being lost in someone’s inbox. Jabber also has the capability to take and send an image from your computer screen instantly, eliminating the need to upload an attachment. Want to know more about Jabber? The LTC will be hosting workshops this semester so you can get to know Cisco Jabber with hands on experience. You do not need to attend a workshop to learn more about Jabber. For those of you who are a little more adventurous, you can check out our Quick Start Guides, by clicking here, to get started on your computer or mobile device. For questions about Cisco Jabber please contact the LTC at ltc@uww.edu. To sign up for a training session, go to https://my.uww.edu/signup/Registration/Details/15365 (and log in with your Net-ID and password). Join us at the LTC office, in McGraw 120, as early as 8:00am for D2L one-on-one support that is focused on your specific D2L needs. We are also offering two sessions of D2L basics, which may include information such as how to lock a browser, upload test questions, upload grades to WINS, and much more! For further questions about the Saturday LTC Instructional Development Event please contact the LTC at ltc@uww.edu. To sign up, go to https://my.uww.edu/signup/Registration/Details/15325 (and log in with your Net-ID and password). 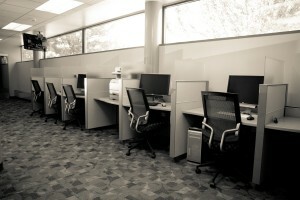 All instructors and students at UW-Whitewater have access to Google Drive. The accessibility for everyone provides a great opportunity for instructors to facilitate an environment for students to work together. For example, Google Docs is an easy way to have students collaborate with each other on group assignments. The instructor can create a Google Doc for each group. For each Google Doc, the instructor would then send out permissions to group members to make changes to the Google Doc. Google Docs allows all group members to make changes simultaneously, with similar functionality as Microsoft Word. One of the major challenges for students, when it comes to group assignments, is finding an opportunity for all individuals to meet. By providing a virtual environment, students can work together remotely when it is convenient for them, to encourage more equal opportunities for all group members to participate in the assignment. An instructor can also see when a Google Doc was last edited, and has the capability to remove permissions when the group assignment is due. For further information on Google Docs or Google Drive, please contact the UW-W Learning Technology Center, or learn about training opportunities by clicking here.